رحیمی بافرانی, ایمان, اختراعی طوسی, حمید. (1395). تحلیل فرکانسی تیر کامپوزیتی آلیاژ حافظه‌دار روی بستر الاستیک پاسترناک با استفاده از چهار نظریه مهندسی تیر. علوم و فناوری کامپوزیت, 3(1), 73-84. ایمان رحیمی بافرانی; حمید اختراعی طوسی. "تحلیل فرکانسی تیر کامپوزیتی آلیاژ حافظه‌دار روی بستر الاستیک پاسترناک با استفاده از چهار نظریه مهندسی تیر". علوم و فناوری کامپوزیت, 3, 1, 1395, 73-84. رحیمی بافرانی, ایمان, اختراعی طوسی, حمید. (1395). 'تحلیل فرکانسی تیر کامپوزیتی آلیاژ حافظه‌دار روی بستر الاستیک پاسترناک با استفاده از چهار نظریه مهندسی تیر', علوم و فناوری کامپوزیت, 3(1), pp. 73-84. رحیمی بافرانی, ایمان, اختراعی طوسی, حمید. تحلیل فرکانسی تیر کامپوزیتی آلیاژ حافظه‌دار روی بستر الاستیک پاسترناک با استفاده از چهار نظریه مهندسی تیر. علوم و فناوری کامپوزیت, 1395; 3(1): 73-84. در چند دهه‌ی اخیر، تولید مواد هوشمند منجر به ایجاد سازه‌های برتر با خواص ممتاز شده است. از جمله‌ی این مواد می‌توان به آلیاژ‌های حافظه‌دار، که قابلیت بازیابی کرنش‌های پلاستیک بزرگ در اثر اعمال تنش یا حرارت را دارند، اشاره نمود. توسعه‌ی عملگر‌های آلیاژ حافظه‌دار به شکل‌های سیم و استنت در حوزه‌های مهندسی و سازه‌های هوشمند بسیار مورد توجه قرار گرفته است. در این راستا، مدل تحلیلی برای تیر کامپوزیتی با الیافی از جنس آلیاژ حافظه‌دار که روی بستر الاستیک پاسترناک قرار گرفته، ارائه شده است. تیر کامپوزیتی دارای تکیه‌گاه ساده در دو طرف بوده و الیاف حافظه‌دار با پیش-کرنش فشاری در لایه‌ی میانی تیر قرار گرفته‌اند. معادله‌های دیفرانسیل حاکم بر تیر‌های اولر-برنولی، رایلی، برشی و تیموشنکو با استفاده از اصل همیلتون استخراج شده‌اند. با اعمال حرارت، عملیات بازیابی کرنش، نیروی کششی در راستای طول تیر اعمال و این نیرو منجر به ایجاد نیروی فشاری در تکیه‌گاه‌ها می‌شود. نیروی ایجاد شده با استفاده از رابطه‌ی تغییر فاز مارتنزیتی مدل شده است. با بی‌بعد‌سازی معادله‌های دیفرانسیل حاکم، روابط تحلیلی برای ارزیابی پاسخ دقیق فرکانس طبیعی تیر ارائه شده است. اعتبار نتایج از طریق مقایسه‌ی موردی با تحلیل‌های مشابه مورد صحت‌سنجی قرار گرفته است. براساس تحلیل‌های انجام شده، تاثیر ضرایب بستر الاستیک پاسترناک، تعداد الیاف حافظه‌‌دار، نسبت ضخامت به طول تیر، حد کرنش قابل بازیابی و نسبت طول به پهنای تیر روی فرکانس طبیعی در دمای بالاتر از دمای پایان آستنیت براساس نظریه‌های مختلف مهندسی تیر تعیین و ارائه شده است. Jani, J. M. Leary, M. Subic, A. and Gibson, M. A., “A Review of Shape Memory Alloy Research, Applications and Opportunities,” Materials & Design, Vol. 56, pp. 1078-1113, 2014. Rogers, C. A., “Active Vibration and Structural Acoustic Control of Shape Memory Alloy Hybrid Composites: Experimental Results,” The Journal of the Acoustical Society of America, Vol. 88, No. 6, pp. 2803-2811, 1990. Tsai, X.-Y. and Chen, L.-W., “Dynamic Stability of a Shape Memory Alloy Wire Reinforced Composite Beam,” Composite Structures, Vol. 56, No. 3, pp. 235-241, 5, 2002. Damanpack, A. R. Bodaghi, M. Aghdam, M. M. and Shakeri, M., “On the Vibration Control Capability of Shape Memory Alloy Composite Beams,” Composite Structures, Vol. 110, pp. 325-334, 4, 2014. Seelecke, S. and Muller, I., “Shape Memory Alloy Actuators in Smart Structures: Modeling and Simulation,” Applied Mechanics Reviews, Vol. 57, No. 1, pp. 23-46, 2004. Ölander, A., “An Electrochemical Investigation of Solid Cadmium-Gold Alloys,” Journal of the American Chemical Society, Vol. 54, No. 10, pp. 3819-3833, 1932. GRENINGER, A. B. and Mooradian, V. G., “Strain Transformation in Metastable Beta Copper-Zinc and Beta Copper-Ti Alloys,” AIME TRANS, Vol. 128, pp. 337-369, 1938. Kurdjumov, G. and Khandros, L., “Firstreports of the Thermoelastic Behaviour of the Martensitic Phase of Au-Cd alloys,” Doklady Akademii Nauk SSSR, Vol. 66, pp. 211-213, 1949. Chang, L. and Read, T., “Behavior of the Elastic Properties of AuCd,” Trans Met Soc AIME, Vol. 191, pp. 47, 1951. Buehler, W. J. Gilfrich, J. and Wiley, R., “Effect of Low‐Temperature Phase Changes on the Mechanical Properties of Alloys Near Composition TiNi,” Journal of applied physics, Vol. 34, No. 5, pp. 1475-1477, 1963. Kauffman, G. B. and Mayo, I., “The Story of Nitinol: the Serendipitous Discovery of the Memory Metal and Its Applications,” The chemical educator, Vol. 2, No. 2, pp. 1-21, 1997. Tanaka, K., “A Thermomechanical Sketch of Shape Memory Effect: One-Dimensional Tensile Behavior,” Res Mech, Vol. 18, pp. 251-263, 1986. Liang, C. and Rogers, C. A., “One-Dimensional Thermomechanical Constitutive Relations for Shape Memory Materials,” Journal of intelligent material systems and structures, Vol. 1, No. 2, pp. 207-234, 1990. Brinson, L., “One-Dimensional Constitutive Behavior of Shape Memory Alloys: Thermomechanical Derivation with Non-Constant Material Functions and Redefined Martensite Internal Variable,” Journal of Intelligent Material Systems and Structures, Vol. 4, No. 2, pp. 229-242, 1993. Boyd, J. G. and Lagoudas, D. C., “A Thermodynamical Constitutive Model for Shape Memory Materials. Part I. The Monolithic Shape Memory Alloy,” International Journal of Plasticity, Vol. 12, No. 6, pp. 805-842, 1996. Lagoudas, D. C. Bo, Z. and Qidwai, M. A., “A Unified Thermodynamic Constitutive Model for SMA and Finite Element Analysis of Active Metal Matrix Composites,” Mechanics of Composite Materials and Structures, Vol. 3, No. 2, pp. 153-179, 1996. Lau, K.-t., “Vibration Characteristics of SMA Composite Beams with Different Boundary Conditions,” Materials & design, Vol. 23, No. 8, pp. 741-749, 2002. Lau, K.-t. Zhou, L.-m. and Tao, X.-m., “Control of Natural Frequencies of a Clamped–Clamped Composite Beam with Embedded Shape Memory Alloy Wires,” Composite Structures,Vol. 58, No. 1, pp. 39-47, 2002. Liew, K. Ren, J. and Kitipornchai, S., “Analysis of the Pseudoelastic Behavior of a SMA Beam by the Element-Free Galerkin Method,” Engineering Analysis with Boundary Elements, Vol. 28, No. 5, pp. 497-507, 2004. Kang, K. Kim, H. and Kim, J., “The Role of Shape Memory Alloy on Impact Response of Glass/Epoxy Laminates under Low Temperature,” Journal of mechanical science and technology, Vol. 21, No. 10, pp. 1682-1688, 2007. Ni, Q.-Q. Zhang, R.-x. Natsuki, T. and Iwamoto, M., “Stiffness and Vibration Characteristics of SMA/ER3 Composites with Shape Memory Alloy Short Fibers,” Composite Structures, Vol. 79, No. 4, pp. 501-507, 2007. Sohn, J. Han, Y. Choi, S. Lee, Y. and Han, M., “Vibration and Position Tracking Control of a Flexible Beam Using SMA Wire Actuators,” Journal of Vibration and Control, Vol. 15, No. 2, pp. 263-281, 2009. Li, J., and Hua, H., “The Effects of Shear Deformation on the Free Vibration of Elastic Beams with General Boundary Conditions,” Proceedings of the Institution of Mechanical Engineers, Part C: Journal of Mechanical Engineering Science, Vol. 224, No. 1, pp. 71-84, 2010. Raghavan, J. Bartkiewicz, T. Boyko, S. Kupriyanov, M. Rajapakse, N. and Yu, B., “Damping, Tensile, and Impact Properties of Superelastic Shape Memory Alloy (SMA) Fiber-Reinforced Polymer Composites,” Composites Part B: Engineering, Vol. 41, No. 3, pp. 214-222, 2010. Barzegari, M. M. Dardel, M. and Fathi, A., “Vibration Analysis of a Beam with Embedded Shape Memory Alloy Wires,” Acta MechanicaSolida Sinica, Vol. 26, No. 5, pp. 536-550, 2013. Andani, M. T. and Elahinia, M., “A Rate Dependent Tension–Torsion Constitutive Model for Superelastic Nitinol under Non-Proportional Loading; a Departure From Von Mises Equivalency,” Smart Materials and Structures, Vol. 23, No. 1, pp. 015012, 2014. Khanjani, M. Shakeri, M. and Sedighi, M. “Non-Linear Transient and Damping Analysis of a Long Cylindrical Sandwich Panel with Embedded SMA Wires, ” Aerospace Science and Technology, Vol. 47, pp. 98-113, 2015. Abdollahi, H. Esfahani, S. Shakeri, M. and Eslami, M., “Non-Linear Thermal Stability Analysis of SMA Wire-Embedded Hybrid Laminated Composite Timoshenko Beams on Non-Linear Hardening Elastic Foundation,” Journal of Thermal Stresses, Vol. 38, No. 3, pp. 277-308, 2015. Han, S. M. Benaroya, H. and Wei, T., “Dynamics of Transversely Vibrating Beams Using Four Engineering Theories,” Journal of sound and vibration, Vol. 225, No. 5, pp. 935-988, 1999. Kaw, A. K., “Mechanics of Composite Materials:” CRC press, 2005. Rao, S. S., “Vibration of Continuous systems,” John Wiley & Sons, 2007. Reddy, J. N., “Energy and variational methods in applied mechanics,” First ed., New York: John Wiley, 1984. 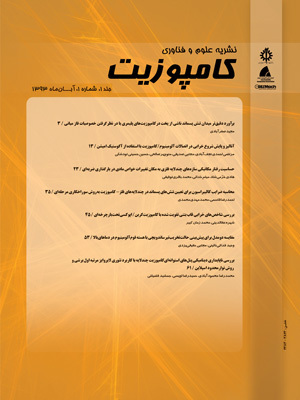 Malekzadeh Fard, K. and Rezaei Hassanabadi, M. “Free Vibration and Static Bending Analysis of Curved Sandwich Panel with Magneto-Rheological Fluid Layer in Sheets Using Improved Higher Order Sandwich Panel Theory,” In Persian, Journal of Science and Technology of Composites, Vol. 1, No. 2, pp. 49-62, 2015.